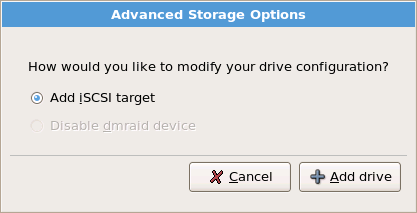 From this screen you can choose to disable a dmraid device, in which case the individual elements of the dmraid device will appear as separate hard drives. You can also choose to configure an iSCSI (SCSI over TCP/IP) target. To configure an ISCSI target invoke the Configure ISCSI Parameters dialog by selecting Add ISCSI target and clicking on the Add Drive button. 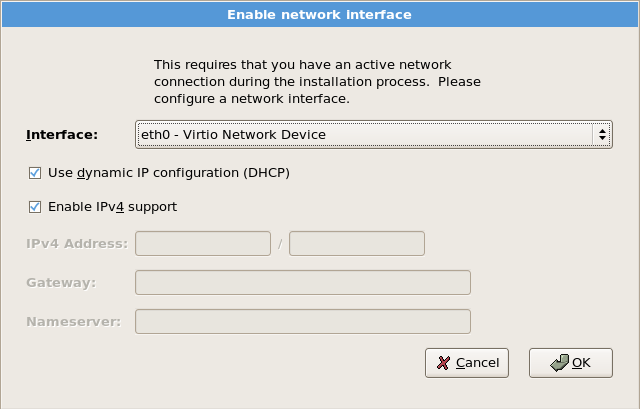 If a network connection is not already active, the installer prompts you to provide details of your network interface. Select your network interface from the drop-down menu, then either leave the Use dynamic IP configuration box checked, or uncheck it to enter the IP address of your system and the IP addresses of the gateway and nameserver on your network. Ensure that the Enable IPv4 box remains checked. 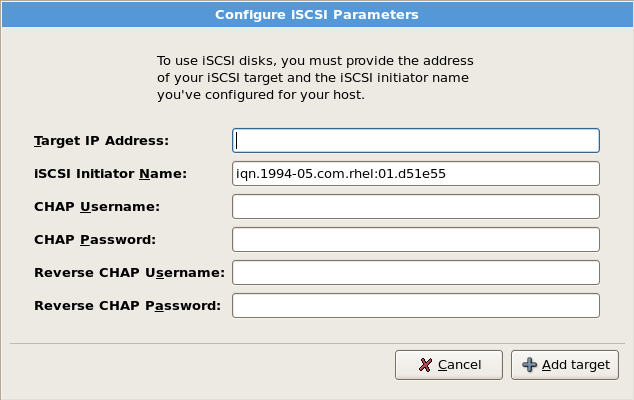 Fill in the details for the iSCSI target IP and provide a unique iSCSI initiator name to identify this system. If the iSCSI target uses Challenge Handshake Authentication Protocol (CHAP) for authentication, enter the CHAP username and password. If your environment uses 2-way CHAP (also called "Mutual CHAP"), also enter the reverse CHAP username and password. Click the Add target button to attempt connection to the ISCSI target using this information. Please note that you will be able to reattempt with a different ISCSI target IP should you enter it incorrectly, but in order to change the ISCSI initiator name you will need to restart the installation.